"CRUEL", "atrocious", "inhumane", "immoral", "shameful" and "heartbreaking". Donald Trump has been accused of many moral outrages during his tenure as President, but he may finally have gone a step too far for America. A wave of anger towards the 71-year-old over his most controversial policy has reached fever pitch, with a desperate White House swinging into damage-control mode. Mr Trump's close allies and family members, as well as the most senior members of the US political establishment, have come forward to condemn his actions. The policy at the centre of this gathering political storm is that of "zero tolerance" to undocumented migrants entering the US, introduced in April. Adults are now immediately charged and jailed and their children taken away from them in traumatising circumstances. A heartbreaking image of a two-year-old Honduran girl crying at the border has gone viral, representing nationwide horror over an inhumane policy. A defiant Mr Trump today insisted American could not become "migrant camp" or "refugee holding facility", and that "a country without borders is not a country at all." Speaking before an event on US space policy, he said the immigration chaos was "very strongly the Democrats' fault," adding that undocumented migrants were causing "death and destruction." With almost 2000 young immigrants removed from loved ones in just six weeks, and distressing stories stacking up, famous figures from both side of politics have been compelled to speak out. Last month, the world was shocked by the #Wherearethechildren hashtag, referring to 1500 children the US government had simply lost after removing them from their families. And the controversy is only growing. "Our government should not be in the business of warehousing children in converted box stores or making plans to place them in tent cities in the desert outside of El Paso," wrote former first lady and Republican Laura Bush in a rare tirade in the Washington Post. Fellow first lady Michelle Obama responded to her: "Sometimes truth transcends party." Mrs Bush's brother-in-law, former Florida Governor and Republican Jeb Bush, added that children "shouldn't be used as a negotiating tool." Former CIA Director Michael Hayden went even further, using a photo of a Nazi concentration camp to illustrate his view on what the White House was going. Trump adviser Kellyanne Conway told NBC's Meet the Press that "nobody likes this policy," while former White House communications director Anthony Scaramucci called it "atrocious". Mr Scaramucci - who was fired ten days into the job after making derogatory remarks about the administration - told CNN's New Day: "It's inhumane. It's offensive to the average American." He said using family separations "as a leverage point or a negotiating point ... just doesn't feel right", adding that the images of children being taken from parents or in holding areas "is very, very bad for the Republican party and it's very bad for the president." Republican Senator Susan Collins, from Maine, said in an interview on CBS' Face the Nation that the practice was "contrary to our values in this country. She claimed the administration was trying to send a message to immigrants that "your children are going to be ripped away from you" if you cross the border with them. "That is traumatising to the children, who are innocent victims," she added. The language was even harsher from Democrats, with Texas Senate candidate Beto O'Rourke telling CNN's State of the Union: "I'd like to say it's un-American, but it's happening right now in America. And it is on all of us, not just the Trump administration." House Minority Leader Nancy Pelosi said Republicans had a moral and legal responsibility to end the "utter atrocity that debases America's values and our legacy as a beacon of hope, opportunity and freedom." She said the "blame for every mistreated child, heartbroken mother and father and broken family rests squarely on the President, and only he can end the trauma." The Vatican weighed in with a statement that emphasised "the centrality of the human person in every political act ... reaffirming the inviolability of human rights and the dignity of every human being on the move." It added: "Children are the ones who are suffering the most from forced migration. We must respond effectively to the challenges created by these flows, balancing the principles of solidarity, subsidiarity and co-responsibility." Melania Trump made headlines yesterday when she said she "hates to see children separated from their families and hopes both sides of the aisle can finally come together to achieve successful immigration reform." While that may look like criticism of her husband, the first lady's "both sides" comment also reinforced the President's line that the immigration policy was the fault of the Democrats as well as his government. Mr Trump's tweets on the subject have multiplied in number and become ever more defensive over the past two days, as he tried to shift blame to the Democrats and warning that criminals were using children in order to enter the US. Mr Trump's ex-adviser Steve Bannon spoke for supporters of policy, telling ABC's This Week: "I don't think you have to justify it. We have a crisis on the southern border." Attorney-General Jeff Sessions said on Monday that law enforcement officials did not want to separate parents from their children, but the policy was necessary. Without the law, he said, "we encourage hundreds of thousands of people year to likewise ignore our laws and illegally enter our country." Protesters gathered as he spoke at the National Sheriff's Association conference in New Orleans, waving placards and chanting, "Free the kids! Reunite the Families!" Homeland Security Secretary Kirstjen Nielsen told the conference the policy was not a matter of cruelty, and officials would not apologise for enforcing the law. She said previous administrations had asked immigration agents to look the other way when families crossed the border illegally, and it could not continue. But the White House is feeling the pressure over its treatment of immigrants now kids are front and centre, with a vote on the legislation set to reach the House of Representatives this week. If it passes, an even more nightmarish Senate debate will follow. Protests are spreading across the US over this political hot potato could be crushing for the Republican party at the midterms, and threaten the President's chance of re-election in 2020. His critics know this. The House may put forward a compromise bill that reverses a court settlement, allowing children to be held with their parents by the Department of Homeland Security. But the parents would still be prosecuted for crossing the border from Mexico without papers, and if convicted, could lose their children anyway. Mr Trump told Fox News on Friday that he would not sign any bill - but the White House issued a statement hours later saying he would support two Republican bills. 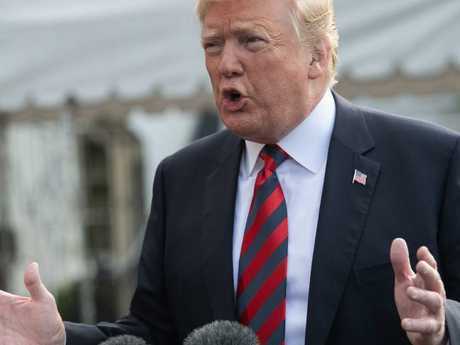 The President will attend crisis talks over the tense immigration issue with top Republican in Washington on Tuesday. They will need to find a balance between pleasing hardline, anti-immigration conservatives and resolving a problem that could be a devastating blow for the party. Mr Trump has made his bed by campaigning fiercely against border crossings and promising a harsh crackdown. Now, he urgently needs to find safer ground. The current outpouring of emotion over protecting vulnerable children is the PR disaster he doesn't need.